UNPLAYED COUNTERS STILL IN STENCILS!!! Chobham armour. Hypervelocity smoothness. Core penetrator and self forging rounds. T80's and AT-5s. Laser rangefinders. Copperhead and duel purpose improved conventional munitions. All the advanced technological hardware of the mid 80s is available, but the men who command and control the hardware remain the critical battlefield varible. 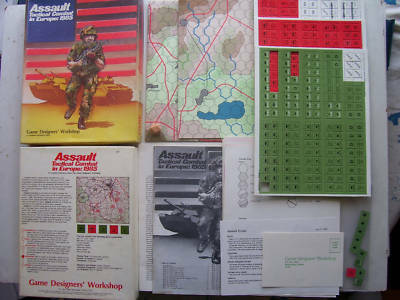 ASSAULT postulates a conventional conflict between the United States and the Soviet Union in the European environment in 1985. The weapons that were once merely dreams of science fiction authors are today entering service, and by 1985 will be standard issue. ASSAULT provides an in-depth examination of the potential of tomorrows weapons.